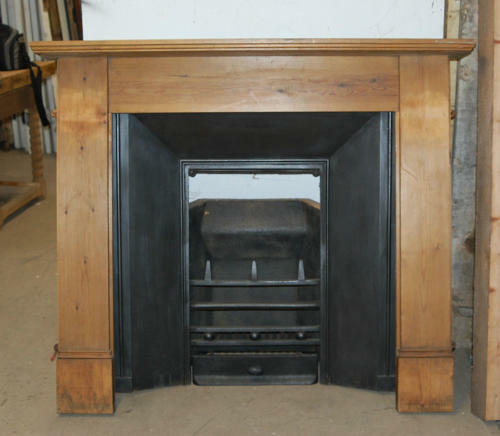 A very interesting and unusual, antique, square cast iron fire insert with simple ball and spike design. The listing includes a new concrete fire back and a contemporary pine fire surround with simple carvings. The insert is very striking and is in very good condition. There are some slight signs of use, with very light marks and there is some surface rust to the back of the insert, as expected. One corner has been bent but this is not noticable as it is set behind the surround. The wooden surround is solid and has a lovely colour and finish. The surround does have a deep scratch and some chipping to one leg and there are some light scratches to the mantel and other areas. The feet have some staining. The fire surround could be stripped and re-finished by purchaser if desired. A simple and attractive fire that would add great style and character to a home.